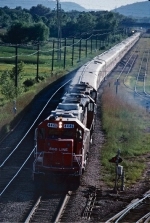 Description: SOO Line GP38-2 4446 at Bensenville, Illinois on October 30, 1986, Kodachrome by Chuck Zeiler. Description: SOO power heads through the interchange at Grand Crossing to pick up the Ringling Bros-Barnum & Bailey Red train from the BN. Description: SOO power pulls the Ringling Bros-Barnum & Bailey Red train from the BN through the interchange at Grand Crossing and into the yard.. Description: SOO power pulls the Ringling Bros-Barnum & Bailey Red train from the BN through the interchange at Grand Crossing and into the yard. Description: SOO power runs around the Ringling Bros-Barnum & Bailey Red train at Grand Crossing. Description: SOO power backs onto the Ringling Bros-Barnum & Bailey Red train at Grand Crossing. Description: The crew completes the air test on the Ringling Bros-Barnum & Bailey Red train before heading east. 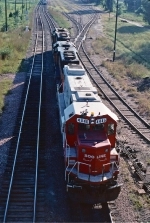 Description: The Ringling Bros-barnum & Bailey red train departs from La Crosse as the CNW train #482 pulls along side. Description: 4603 and 4446 move east, from Humboldt to Pig's Eye. Description: 885 with a real classy lashup! 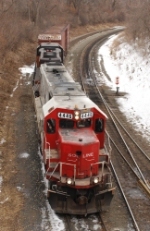 Description: CP train 885 has some SOO Line help today. SOO 4446, SOO 4450, SOOO 66? 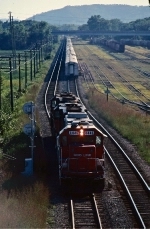 ?, SP AC, UP SD90MAC. Description: SOO GP38-2 4446 heads west through Franklin Park with a local passing UPs E9s. Title: Milw 261 / CP steam double header in Red Wing MN fall of 2007. Description: Four big GE's and an ex-Soo GP38-2 lead a long freight train near BNSF's Northtown Yard. 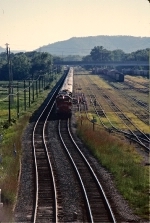 Description: Switching the Red Rock industrial spur. Description: The 4446 is showing its age. Description: The 4446 finally arrives at the small yard in West Saint Paul with only one Auto Parts car. Who knows, this may be the first and last time that I actually shoot the Ford Hauler. Description: The Ford Hauler tiptoes across the ancient timber trestle while enroute to hand off one, just one, auto parts car. A few hours later he will come back with 11 autoracks. Not sure if they were loaded. Description: Soo 4512 and Soo 4446 move around the very empty Ford Yard. This goes to show you how bad of shape the auto industry is in. This place was packed back in September. Description: Soo 4400 sits outside of the diesel shop with the 4446 on a sunny day.